After a great night’s sleep, I was craving some brunch and on a previous walk, I had noted a place down the street that looked like a winner. It had a pretty strange name, Sweet & Pepper Days, and a menu only in Czech which made ordering a challenge. After some awkward back and forth, I think I had ordered some sort of egg and toast dish, while Chris went for the far easier option Full English Breakfast, which was actually in English. My meal ended being a delicious egg sandwich with cheese and bacon. It was exactly what I needed and due to my hunger, I neglected to take a pic of it. Oh well. Chris said his was the best version of the English breakfast he had this trip – high praise indeed. I also got one of their freshly baked chocolate peanut butter walnut cookie, which was superb. 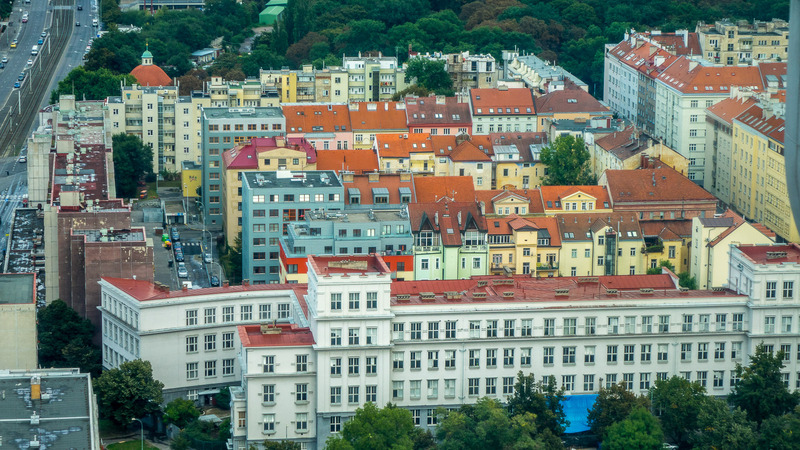 Our plan was to head back to the loft for Chris to get his camera and then walk to the Zizkov TV tower for some great views. However, this was temporarily thwarted by an absolute downpour that seemingly came out of nowhere. Thankfully, it was relatively short-lived and an hour later, the sun was out again and blue skies appeared. 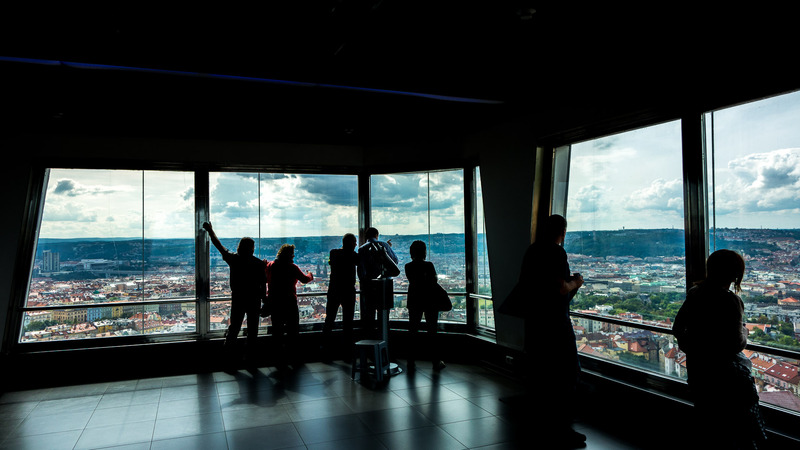 Located in nearby Prague 3 area, the tower was pretty hard to miss. 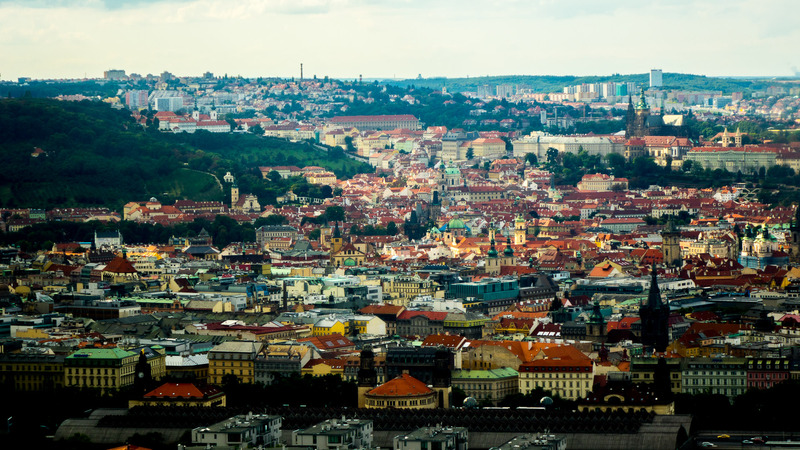 I had read that Prague 3 was the hipster part of the city and based on the people out and about, that seemed about right. Near the tower was a street fair which seemed to be a bit less attended due to the aforementioned showers. A few minutes later we were at the base of the tower, which represented the Communist aesthetic in all of its transcendent ugliness. 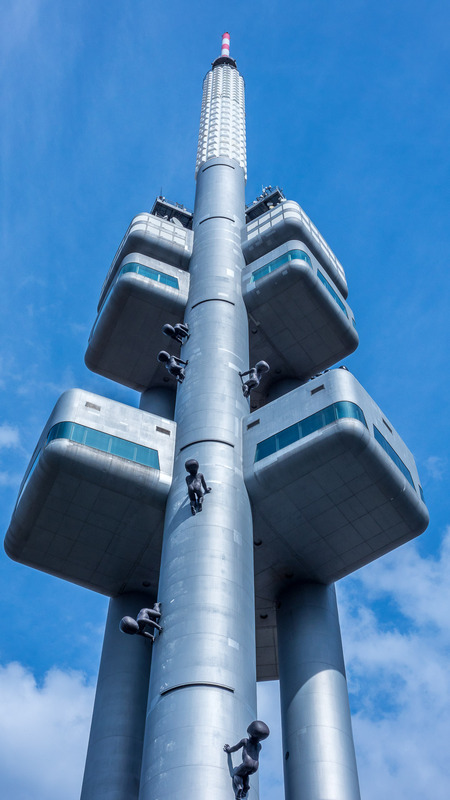 Those wonderfully strange giant babies crawling up the tower were due to a local artist who apparently specializes in them as we had seen others around town earlier in the week. 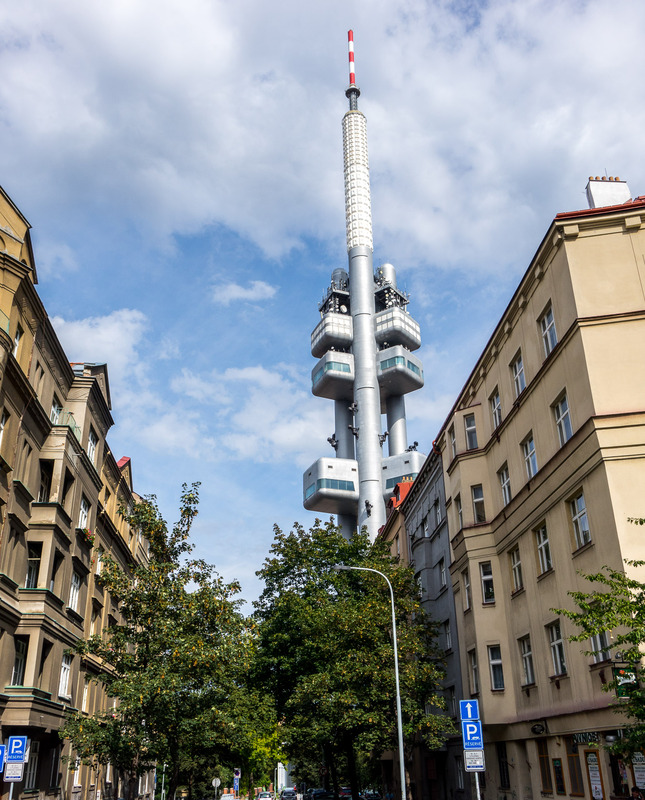 Built between 1985-1992, it is a still working TV tower, though now converted to digital transmission. 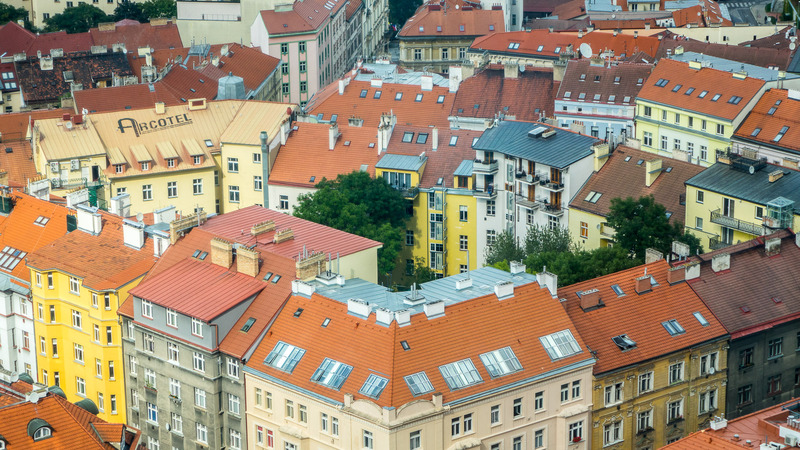 Originally decried by the locals, it’s now a treasured landmark and a symbol of Prague’s communist past. 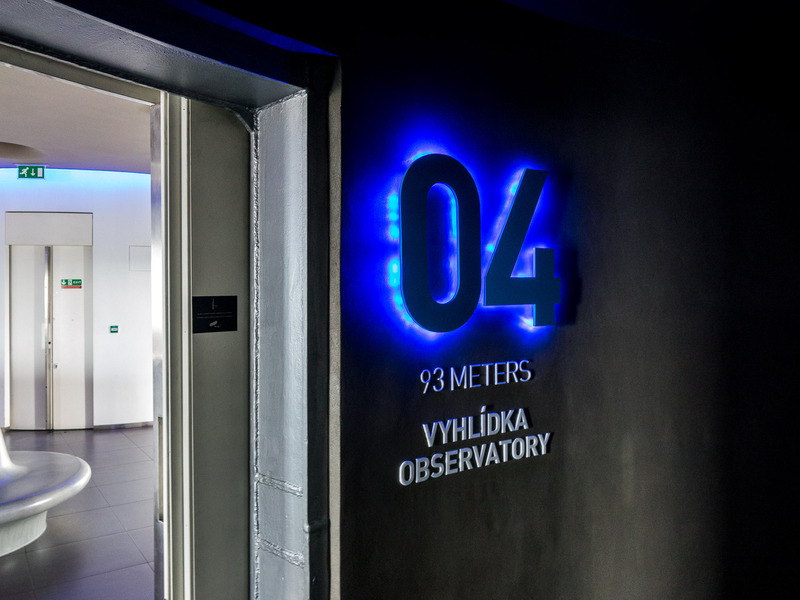 After entering a very sleek lobby, we purchased our tickets and were instructed to head to the 4th floor, which was 93 meters up. As promised, the views of the city were pretty fantastic. 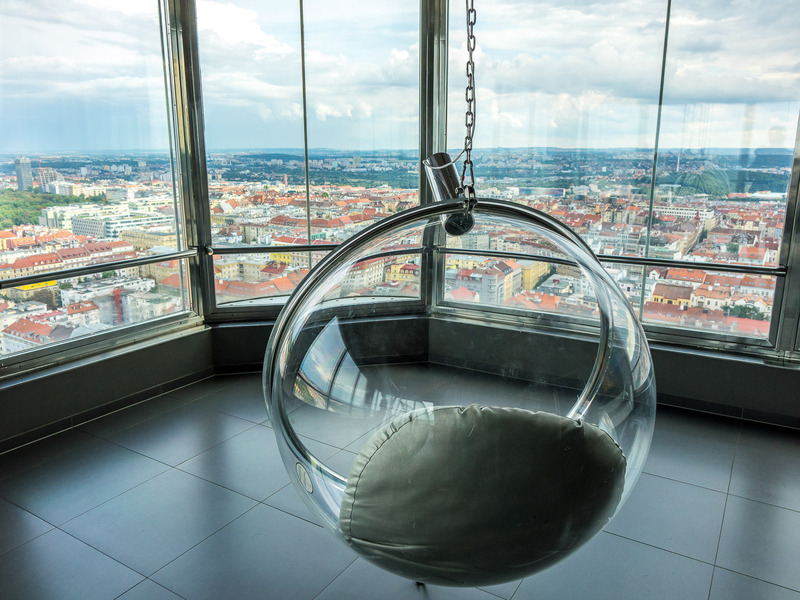 I also appreciated the fun hanging chairs, which were very comfortable and with the accompanying sound of the city being piped in, made for a nice rest to appreciate the city from high above. We got back on the elevator to check out the 3rd floor views. However, it turned out that level was dedicated solely to the restaurant/bar. Still, it was a lazy Saturday and the bar looked interesting so we decided to take a cocktail break. Both the heavily stocked bar and the various instruments on display made it clear this was a true mixology spot, and the creative drink menu followed in suit. Chris went for something called “Three Faces”, which the bartender explained were 3 different cocktails in test tubes. I selected the Old Fashioned, which seemed normal except for the mention of “orange smoke”, so that I had to try. 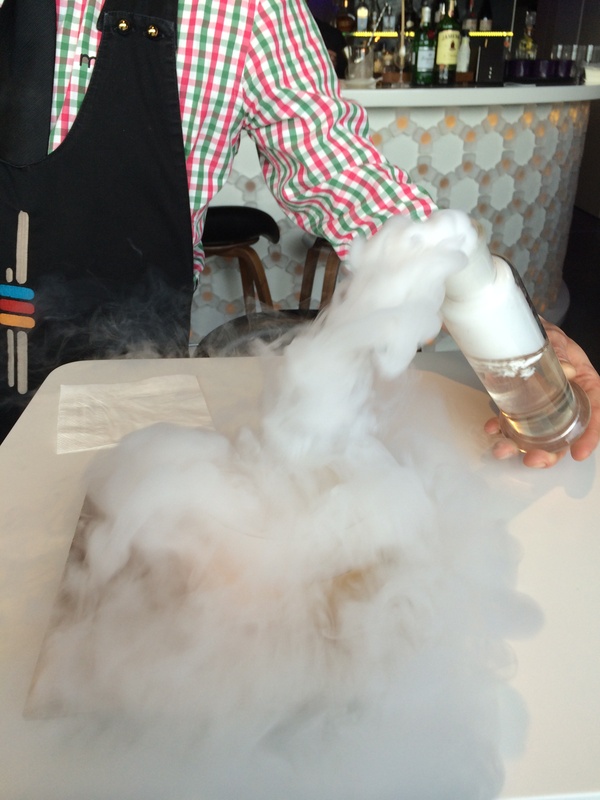 The “orange smoke” turned out to be dry ice, which had been fortified with orange liqueur for the first taste of the cocktail. As evidenced above, it made for quite the spectacle. 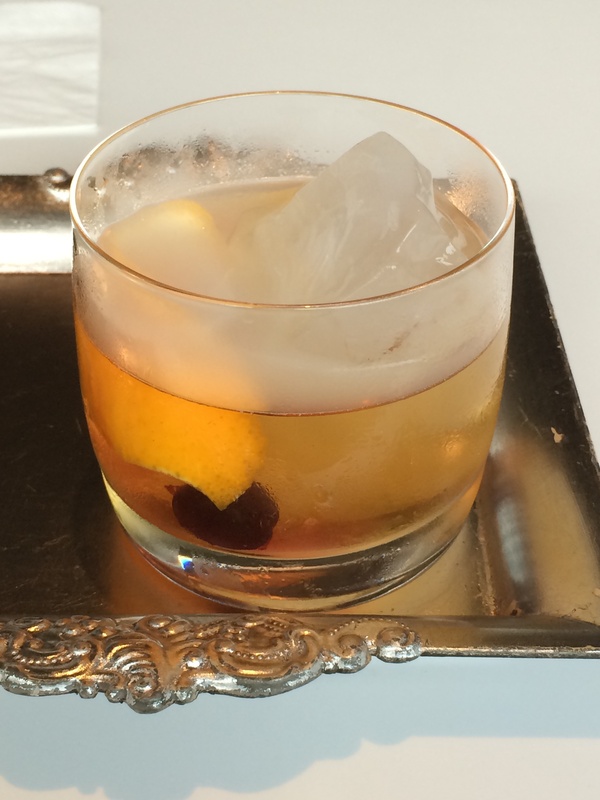 Once dissipated though, the end result was a very proper classic Old Fashioned. The skies were starting to turn a bit too grey for our liking so we quickly finished up and headed back to the loft. Sure enough, moments later the rain kicked up again so that meant it was nap time. After a couple of hours of rest, we were back on the streets, making a relatively short stroll to that evening’s restaurant, Cestr, a modern Czech steakhouse. 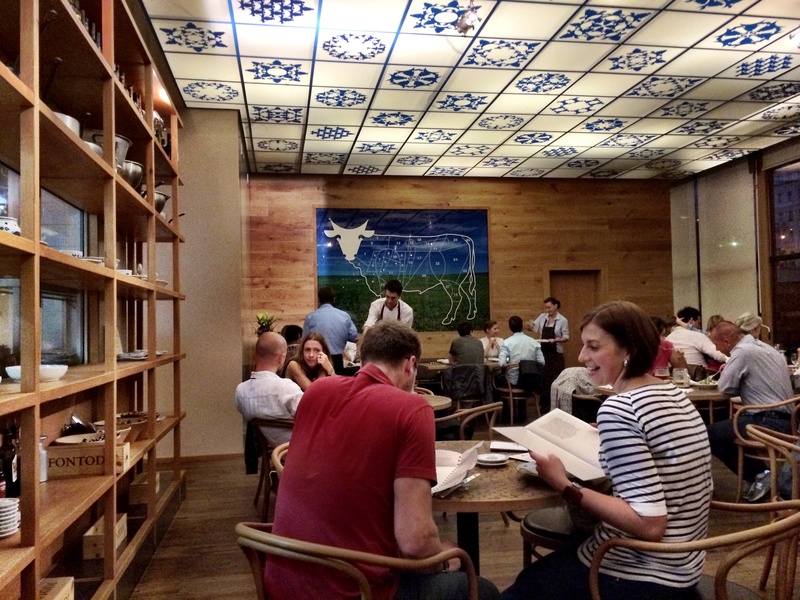 Cestr, which is an abbreviation of the famous Czech spotted cattle, was the fourth of the Ambiente Group’s restaurants we had been to, all of which had been stellar. I had discovered it due to its unique choice of dessert, which will be explained in a bit. The large room was bustling with locals as this wasn’t exactly on the main drag, all the better really. There were several options from which to choose but both of us were drawn to the 3 course option along with sides. 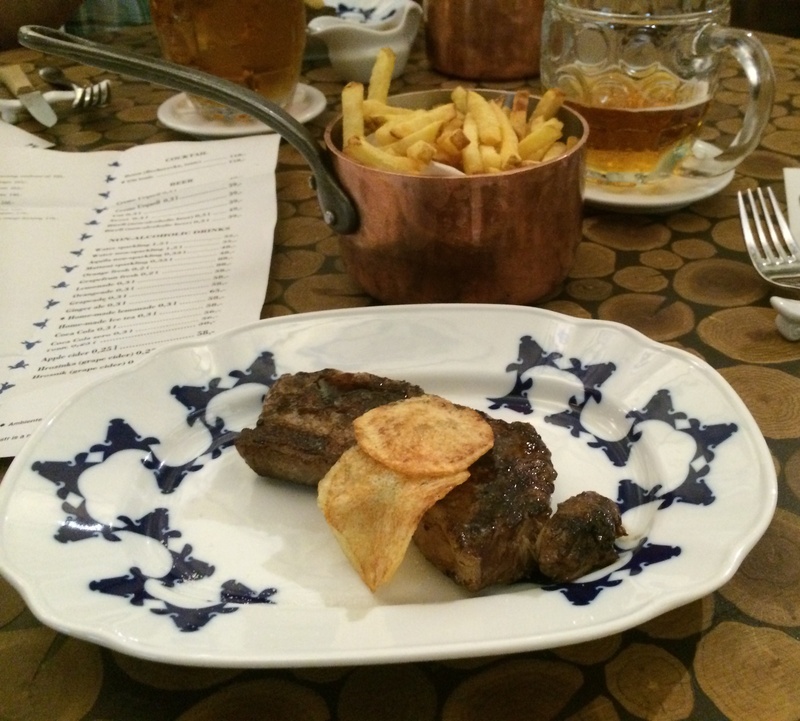 After selecting a creme version of the ubiquitous Pilsner Urquell, I opted to start with the intriguingly titled “steak sashimi”, then the beef shank cooked in goose fat and finally the sirloin strip while Chris had the steak tartar, trout with peppers and the rump steak. The steak “sashimi” were cuts of the finest pieces of tenderloin that had been soaked in soy, mirin and green apples. 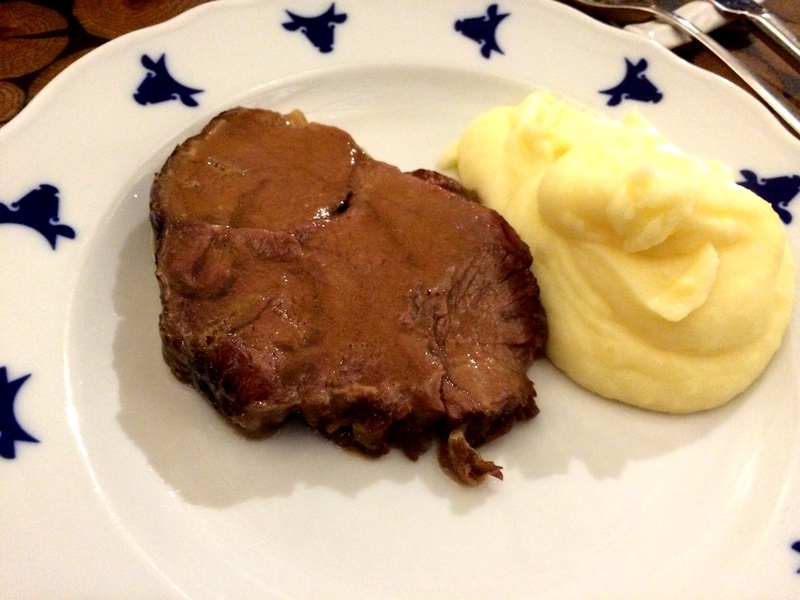 The steak barely needed to be chewed and the sauce was just the right balance – a very good start. 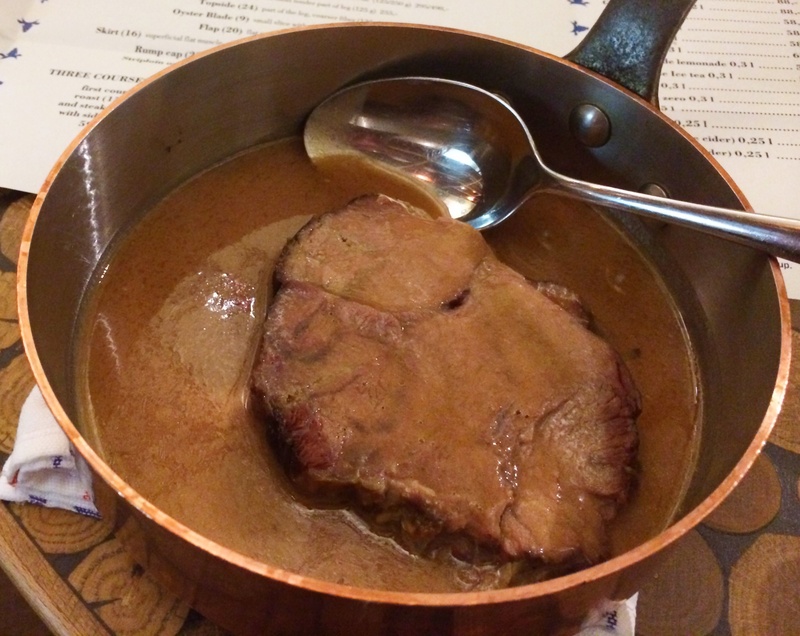 The shank had a deep richness from the goose fat and the accompanying gravy made each bite very succulent. 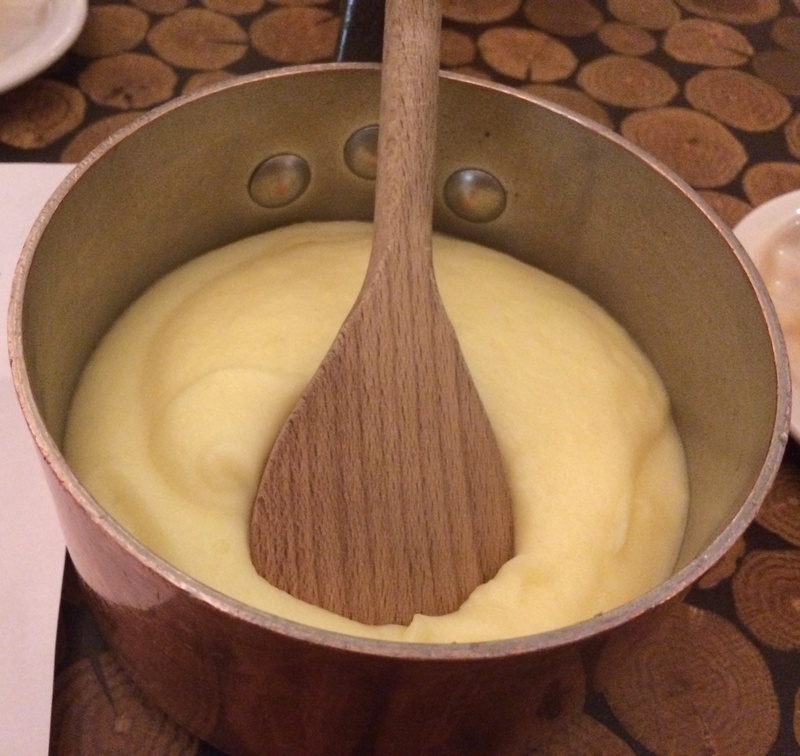 However, the start of the show were the absolutely perfect mashed potatoes, which I’m sure had been made with an insane amount of butter and cream – so so good. Continuing with the steak and potatoes theme, the final course was a beautifully cooked sirloin strip with some very crispy fries. Despite being very full from this meat-a-palooza, I knew I had to save a bit of room (so no second beer for me) for the reason I had come there – dark beer ice cream. Although there was a more elaborate version the waiter suggested, I knew I just wanted a single scoop. 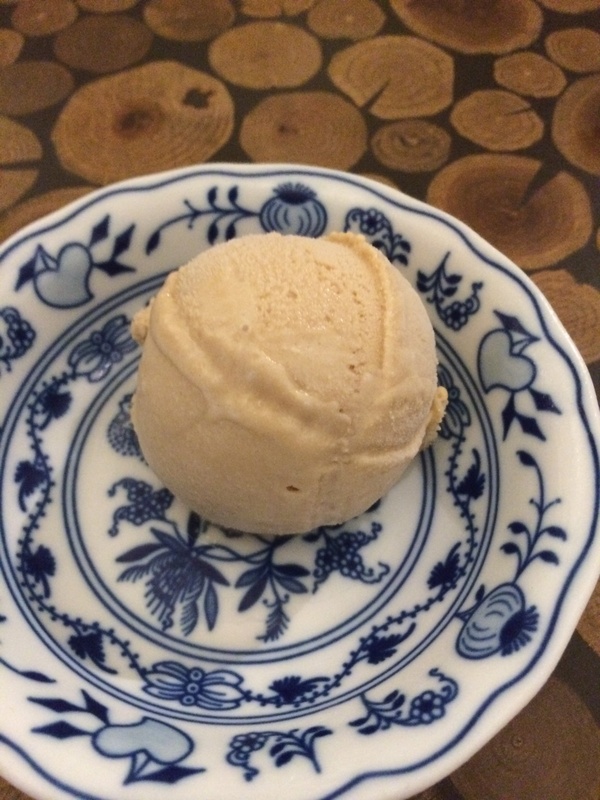 Using mostly just the foam of a local dark ale, the ice cream tasted like a sweetened version of the head of a dark ale mixed with some very strong coffee notes. As I had to give up coffee ice cream years ago due to sensitivity to caffeine, I was in heaven with this. With no more room and a wave of exhaustion setting in, we left the restaurant and returned once more to the loft. 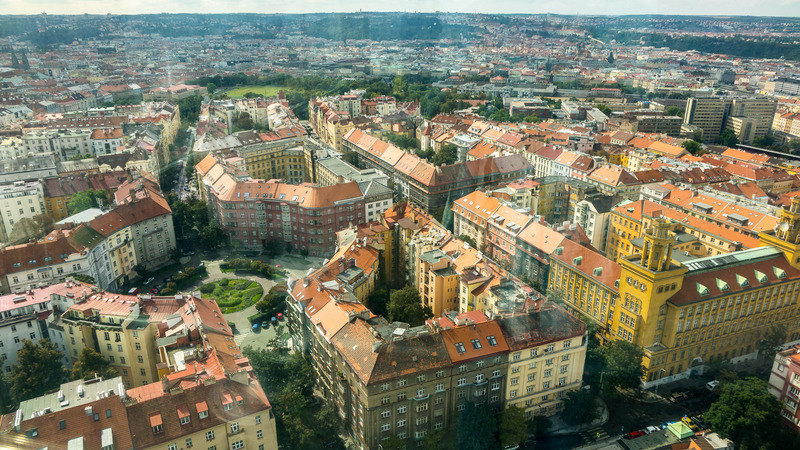 Tomorrow was our final day in Prague and since the weather didn’t look very promising, it would be a mostly indoor one.